SIZES AS AVAILABLE. 8 stud wide fit "old school" mid rugby boot. Black/cobalt/silver. 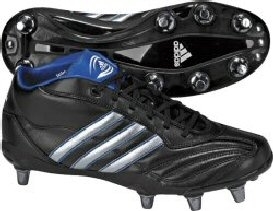 3 stripes on the side of the rugby boot. SHIPPING NOTE: Shoes shipped to the US by any other mode than Expedited Mail may have additional duties, tax, or fees payable upon receipt of goods.